Owen Shaughnessy is a brilliant astrophysicist, but his social skills are still those of the awkward, nerdy outsider that he has been all his life. Even among his exuberant family, he never quite fits in, although they are devoted to him. He and his twin, rock star Riley, are especially close. With all his brothers finding love and settling into marital bliss, Owen is newly aware that he needs more than a string of degrees and challenging research. When his mentor, Dr. Howard Shields, introduces Owen to his niece, Brooke Matthews, and suggests that she is just the person to serve as an assistant on an upcoming project, Owen is overwhelmed by her beauty and her art. Brooke, a former beauty pageant winner and former “mean girl,” is trying to establish herself as an artist. She grew up pretty and popular but essentially shallow. She has matured through some tough lessons and is determined, despite her parents’ objections, to become more than wife to a husband with the right credentials and appropriate bank account. 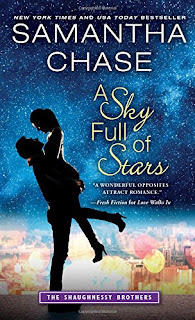 She is excited by her uncle’s suggestion that working as Owen’s assistant on the meteor-shower project in Red Rock, Nevada, would allow Brooke to paint the desert sky and satisfy her parents’ concerns about the dangers of a solo trip. But Brooke also wonders if she, with no degree and little practical experience, can really help the brainy Owen. Owen and Brooke are attracted to one another from their first meeting. She sees him as more than an amazing intellect. She finds his shyness endearing, and she values his decency and kindness. Owen sees her as more than a beautiful woman. He is drawn to her sweetness and to her passion for her painting. But their differences create insecurities. Brooke questions whether Owen can care for someone who is intellectually inferior to him, and Owen doubts that the poised and beautiful Brooke can be attracted to an awkward, nerd who is more apt to cite obscure facts than to converse smoothly. With time and some help from Uncle Howard who has their best interests at heart, they find their way to one another and their HEA. This is the very best kind of opposites-attract story. The differences in Owen and Brooke challenge them to grow and enlarge their worlds. He teaches her about the wonders of science, and makes him believe in magic. Underneath the differences, their values and their dreams are remarkably similar. It is easy to believe that these two belong together. The Shaughnessy family and Howard Shields are also appealing characters who add emotional depth to the story. This is the fifth book in Chase’s Shaughnessy Brothers series, and it is the one I have anticipated most eagerly. It was even better than I hoped. Brooke is a sympathetic heroine, and Owen is a heart-stealer, particularly for readers who love a good nerdy hero. Each brother’s memories of their mother and her understanding of who they were as individuals has played a significant part in his book and in the revelation of the hero’s character. Owen’s memories may be the most poignant and tender. Another connection between him and Brooke is the loss they have experienced and its lasting effects. I found this book satisfying on multiple levels. If you appreciate contemporary romance that is genuinely sweet with a character-driven story enriched with family ties, I highly recommend this book. I think it is the best of a strong series. The series concludes with the release of sister Darcy’s book, Holiday Spice, on October 3. I can’t wait to read it. Thank you so much for the wonderful review!! "Underneath the differences, their values and their dreams are remarkably similar"
Our world is remarkably complex and can be understood in many ways. I think that people from different cultural backgrounds e.g. scientists and artists, may both search for an underlying truth and beauty, but from different perspectives. Apparent opposites may actually be attracted by different facets of the same underlying reality. I like fiction that explores this type of 'opposites attract' theme and this book does sound very good. I'm adding it to my watch list, hoping that a good audio version will become available soon. Thanks for another great review Janga. Thank you for such a wonderful review. I have not read any of the books in this series. You make Owen and Brooke sound like a lovely couple who are blessed to find one another. You also have provided me with another series I need to read. Thanks for the review. This one sounds perfect. I get very tired of Alpha heroes at times and appreciate the softer, intellectual side of the male of the species every once in awhile. I need to catch up with this series, but it is tempting to read this one first. This sounds like a lovely story.